Episode 17 - With this episode, we finally get back to the main characters and the main storyline. The news of the Pandava's emergence from obscurity has reached Hastinapur, and King Dhrtarastra has to make a decision-- does he go along with his favorite son and launch a surprise attack on Pancala? Or does he follow his uncle Bhisma's advice to make Yuddhistira heir to the throne. His conclusion is to try to strike an impossible balance between these two extremes, and he divides the kingdom, making Yuddhistira king of the lesser half of the Kuru lands. This episode has a little more commentary than I usually give, and I hope no one is too bent out of shape by my critique of the Bhagavata Purana and the way Krishna is portrayed in there. If you have anything to say that might change my opinion on the matter, please leave some comments on this blog. I'd love to hear from you! Unfortunately, my day job has gotten busy lately, so I've not been able to produce new episodes at the rate I was doing it in February and March, but I'm already started on the next episode, and I've come up with a new way to produce the material that will hopefully make up for the limited amount of time I have for this project! it's always such a joy to listen to these podcasts, and each time I find that a new one has arrived, it makes my day. 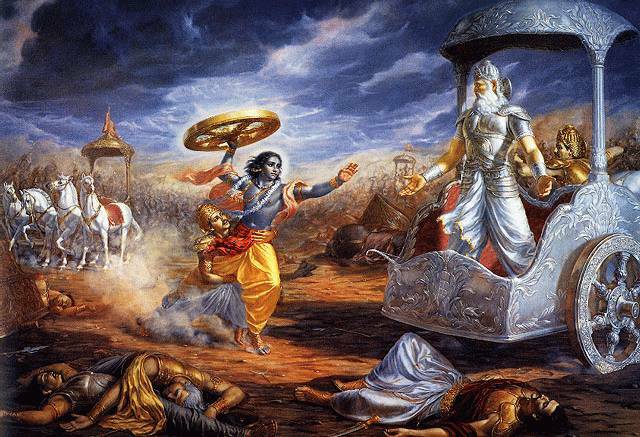 I also find the Bhagavad Gita to be the most intriguing and beautyful religious work I have read. Thanks for and interesting podcast! Check out this link from wikipedia on the Harivamsa.